Spanish Club will meet twice a month. Spanish club is for any student who wants to learn more about Spanish culture and have an opportunity to practice Spanish. One meeting per month will be dedicated to the viewing of a Spanish movie. This movie viewing will count towards the movie requirement for Spanish 5. 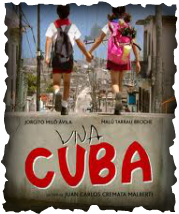 Once a month the Spanish club will show a movie related to Spanish culture after school. Usually these movies will usually be in Spanish and are appropriate for high school students. If you are a middle school student who would like to attend a movie please see your teacher before the movie viewing to get a parent approval form.